This is Crunt (derived from Crotchety Runt and only coincidentally sounds like a rude word). He’s like Grumpy (from the Seven Dwarves) but without the charm. 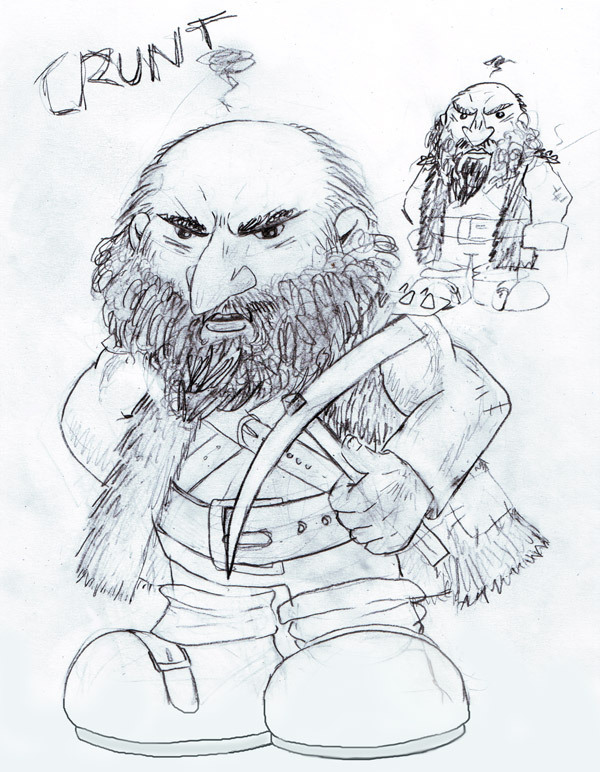 This is the dwarf that other dwarves find too offensive to be around. Crunt is not evil (Lawful Good actually), he’s just unpleasant, rude and smelly (he’s afraid of water). It often annoys me in computer RPGs how you are not allowed to role-play a rude character without it being considered evil. Someone can be ill-mannered yet still carry a good heart. Crunt is the epitome of low Charisma. Now many, many people get low charisma confused with low Comliness – but comliness is how physically attractive/unattractive you are whereas Charisma is about how attractive your personality is. Look out for an example of low Comliness next week when I’ll be doing the concept art for Crunt’s sidekick Fugly.